In stock -This product will ship today if ordered within the next 6 hours and 46 minutes. 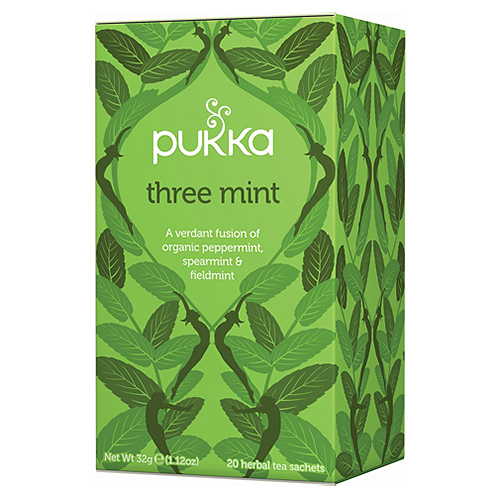 Pukka Three Mint Herbal Tea Three Mint is a refreshing blend of organic peppermint leaf, spearmint leaf and fieldmint leaf. Delicious. Indulgent tea, brimming with flavour. Refresh`s & soothes digestion. 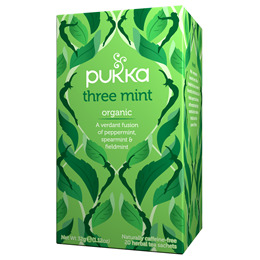 Below are reviews of Pukka Teas Organic Three Mint - 20 Teabags x 4 Pack by bodykind customers. If you have tried this product we'd love to hear what you think so please leave a review. Actually taste of mint, unlike some other brands. Like that they are individually wrapped, always have some in my bag. Really enjoy this peppermint tea. As individually wrapped they keep fresh and easily transported.